Along with Charminar, the other thing Hyderabad is known for is its biryani. Citizens of no other city can remotely come close to the fascination for biryani that we Hyderabadis have. We steadfastly refuse even any comparison with the other variants of biryanis in India, let alone accept that they come anywhere close to it in taste. 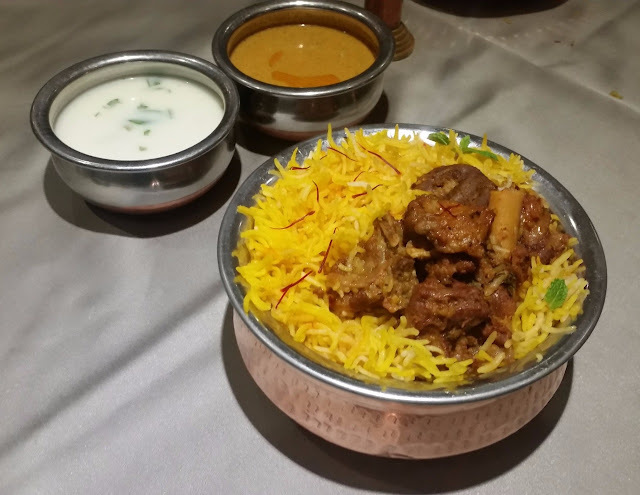 Many of my friends and other tourists visiting Hyderabad come up to me with a specific query – where to try out this delectable dish in the city. This post is a summary of my experiences of relishing this iconic dish, a few places where I have liked the biryani and a few tips to enjoy it well. Let us look at Hyderabadi biryani closely. It is supposed to be a dish which originated in the army of the Nizam. The army was mostly on the move, so there was a need for a dish which needed to be cooked easily, with minimum utensils and have both rice and meat. So the idea of putting rice, meat and masalas on dum resulted in the Hyderabadi version of the biryani. Of course, there are more versions about the origin of this dish. One version states that the Mughlai biryani met the Deccani spices and became Hyderabadi biryani. The other talks about the biryani originating from pilafs (pulao) which was a dish of Arab traders who entered the country through the West Coast. 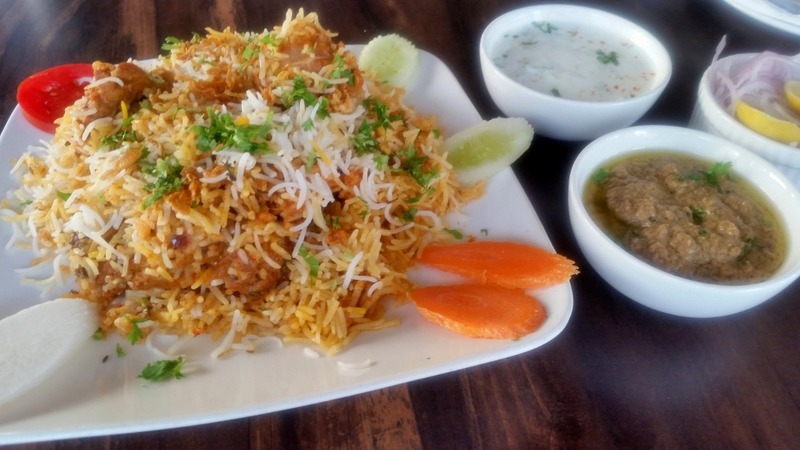 The popular version of Hyderabadi biryani is called Kacchi Biryani as the meat is marinated in masala and then layered and then cooked along with the rice in a slow fire. This is as opposed to Pakki where the meat is pre-cooked to a certain extent before being added to the rice. While it is important that the Hyderabadi biryani is prepared well, it is also imperative to make sure it is served the right way. A well-prepared biryani not served the right way can spoil the taste to an extent. As we open the biryani handi, on top is the flavourful but dry rice, and as you dig in under, you find the spicy and moist rice with masala and finally the meat. Ask the person serving you to serve a biryani cut across all these layers, otherwise, you may have either more of bland rice or excessive masala. Usually, Mirchi Ka Salan and Dahi Raita are served as accompaniments, but if the biryani is good, real connoisseurs of biryani would like to enjoy it in a standalone mode. Normally any of this restaurants will have a special biryani, where the ratio of meat is much higher compared to the usual ones. If you like spicy food, ask for double masala, where they will put stuff from the middle and lower layer of the handi. Talk to the waiter or at the takeaway counter and give your specifications, so that you are served a biryani close to your palate. For a takeaway packet, usually the masala rice is at the bottom along with the meat, so while opening it makes sense to cut open the bottom portion and gently easing the biryani out of the packet. This ensures that the white rice stays on top of the masala, as in the handi. 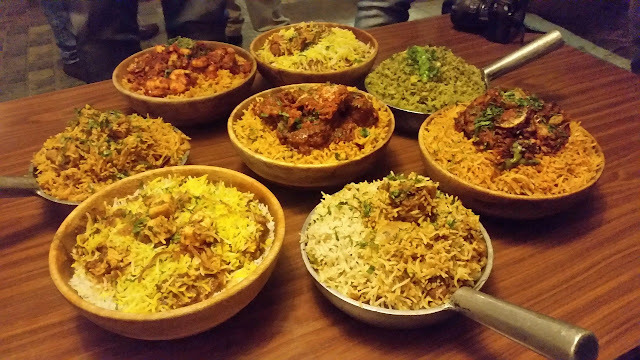 Any Hyderabadi is a self-professed biryani expert and has his own list of favourite biryani joints. I too have one which is given below (not in any order). A small note of caution – do not expect ambience and very clean surroundings in most of the Irani joints of Hyderabad. 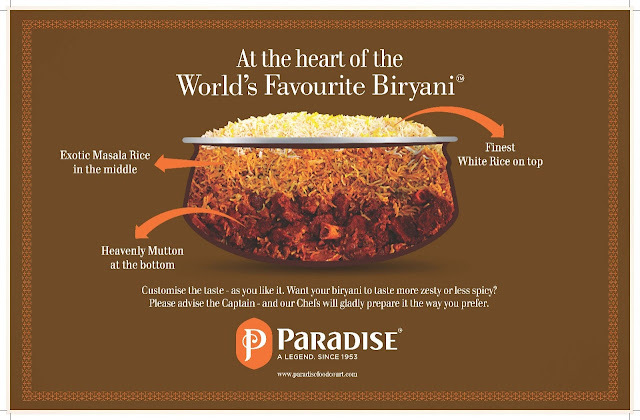 In modern times, Paradise Restaurant has made Hyderabadi biryani famous. 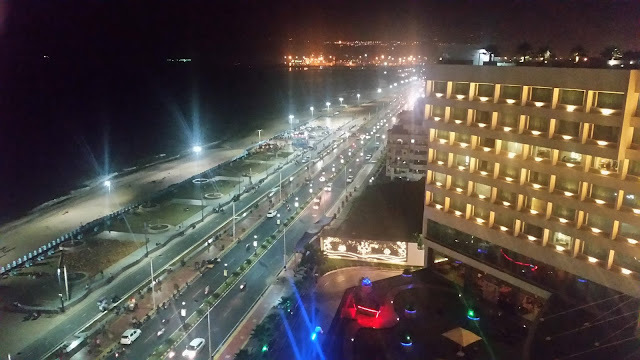 The restaurant, a brand of more than fifty years, has expanded rapidly and has branches all over the city, as well as Bangalore, Chennai, and Gurgaon. Any visitor to Hyderabad including foreign delegations includes a visit to Paradise restaurant as a must do in the city. These days some true blue Hyderabadis feel that the taste of Paradise biryani has gone down, and their tribe seems to be increasing. However, there is no denying the fact that Paradise has had a huge role to make Hyderabadi Biryani a mega food brand, and it is still by miles the largest selling restaurant chain in the city. My personal experience here has been mostly good, and undoubtedly on their best day, their biryani is hard to beat. However, they have their bad days too. They also have a nice tablemat exhibit explaining how to eat a biryani, which is a good step in customer education. Shah Ghouse, at Tolichowki, Charminar and now Gachibowli is well known for the Haleem during Ramzan. But this place belts out some great biryani too. The biryani here is spicier with medium masala and some succulent pieces of mutton. But the blend of spices is just perfect which makes this biryani special. The kababs here are also must-haves. Meridian, at Panjagutta: Panjagutta Mutton Shop is possibly the most famous mutton shop in that area. A few years back Yusuf Bhai, the owner of the mutton shop started Meridian Hotel just next to it. In a short period, the place has become very popular for its aromatic biryani. The highlight of their biryani is that they use Potla goat meat for their biryani. Unlike most of the Irani Cafes, their Mirchi Ka Salan is not to be missed. Try their Tala Hua Mutton too, perhaps the best for the mutton version in the city. 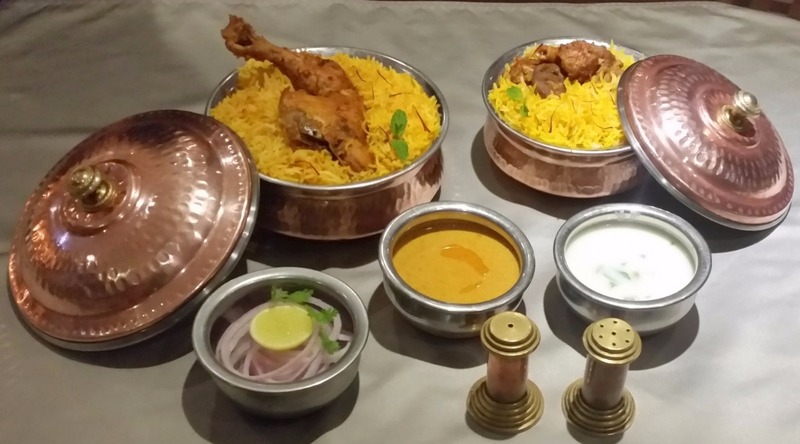 The biryani from Bawarchi, at RTC X Roads (www.bawarchihyd.com), is so popular that many restaurants have opened up in the city with Bawarchi as part of their name. So you have green, golden, new and many other Bawarchis. However, the one and only original Bawarchi is at RTC X Roads. The biryani here uses the best rice, is flavourful and not overly spicy, and the masala is to die for. I love their grilled chicken too which is perhaps the best in the city. Shadab, at Madina near High Court, is another iconic restaurant in Hyderabad known for paya, nahari as well as its biryani. The biryani here is aromatic, well cooked and spicy, but be prepared for a long wait to get a table. If you happen to visit the Charminar area in the forenoon, do not miss the Paya Nahari breakfast here. Café Bahar, at Basheerbagh, is favourite of many Hyderabadis. The biryani here is a milder version and has a lot of flavourful yellow rice which can be eaten on its own. In fact, I love to have this rice with a little bit of salan by the side. Like most Hyderabadi Irani cafes, consistency is sometimes an issue here. Zaiqa-E-Hyderabad, a new restaurant in Banjara Hills is becoming extremely popular for its Hyderabadi food. 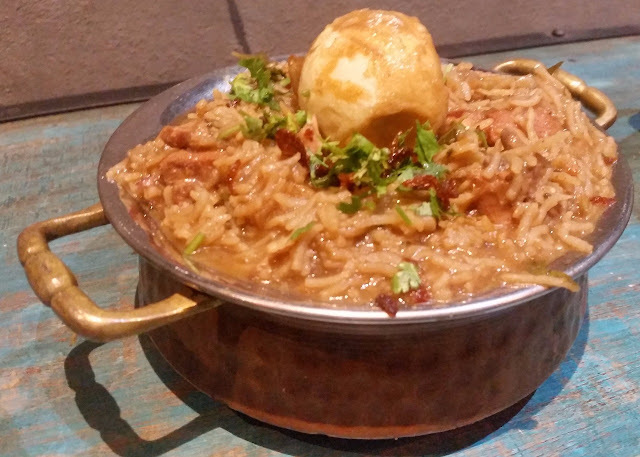 Their version of biryani is extremely balanced with no flavours overwhelming the other. If you want to enjoy your biryani in a fine dining environment, this may be a good choice for you. A few other places in the favourites list of many people are Mohini in Basheerbagh and Shahi Dastarkhwan in Lakdi Ka Pool. Among the restaurants in star hotels, Firdaus at Taj Krishna, Aish at The Park and Jewel of Nizam at Hotel Golkonda are known for their biryanis. There are few other varieties of biryanis which are native to Hyderabad and around. Kalyani Biryani is the poor man’s biryani prepared with beef. Places well known for this are Alhumdulillah at Nampally and Hotel Prince at Mehdipatnam. The biryanis available in Andhra restaurants are essentially pulavs. However they are delicious in their own way, and a visitor to Hyderabad should try them out too. Ulavacharu and Spicy Venue are some of the restaurants serving this version of the rice and meat dish, and they continuously innovate to present new versions of the dish. Have your favourite biryani place? Mention in the comments below.